It's quick and a great combination of pre-packaged convenience, plus fresh vegetables and just a little meat for a flavor punch. The thinly sliced pork cooks quickly and if you want to omit the pork, you can easily just add kamaboko or even go vegetarian. We used to be able to feed a family of four with one package of yakisoba, but once the teenage years hit, we have had to increase to 2 packages. One package will easily feed a family of four if two of them are small children. or any Japanese grocery store. 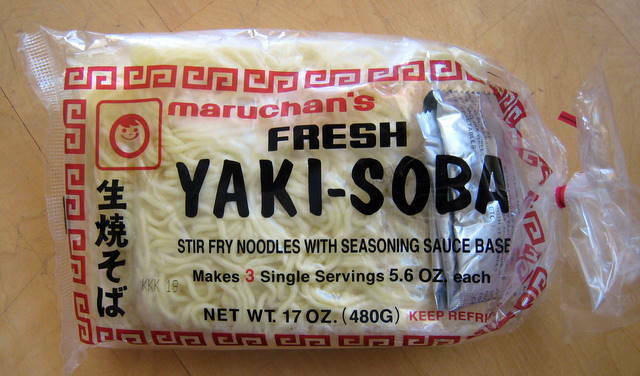 My preferred yakisoba. Also freezes well. Heat a bit of canola oil in the wok. Lightly salt and pepper the pork. When the oil sheets, stir-fry pork until just done. This should take a few minutes. Take pork out and set aside. Stir fry green beans, carrots and optional kamaboko until just done and kamaboko is heated through. This should take another few minutes. Take out and put with the pork. If necessary, add a bit more oil. 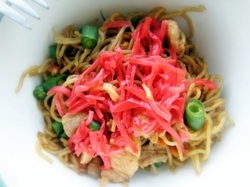 Break up the yakisoba noodles and dump them into the wok. Drizzle water into the pan to cook the noodles.It will steam and sizzle up. When the noodles are cooked but not crunchy, add cooked pork, green beans, carrots and optional kamaboko back in. Sprinkle the seasoning packets in and mix well. Top with kizami shoga and eat.